QuickTime is the media player that comes with Mac OS X Snow Leopard. 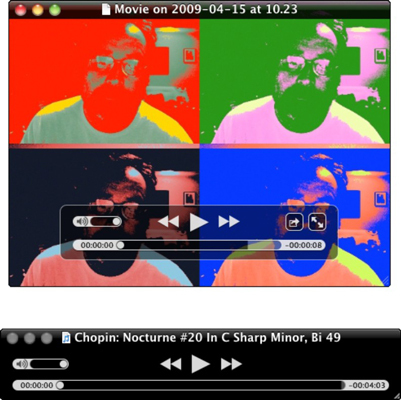 QuickTime was created by Apple to perform all sorts of multimedia functions. Although normally associated with movie playback, QuickTime Player can do much more. Whether it’s playing movies, audio, animation, or music, QuickTime acts as the main engine that drives all your multimedia needs. Close, Minimize, and Zoom controls: These three controls appear at the top-left corner of most windows in Mac OS X.
Resize handle: Drag the lower-right corner of QuickTime Player to resize it for movie playback. Hold Shift while dragging to break free from constrained resizing. If the document contains only sound media, the window grows or shrinks horizontally when you resize it. Although some window features are common to all QuickTime Player windows, many features depend on the type of media that you wish to play. QuickTime Player sports different controls, depending on the media you play. Playback begins when you click the Play button. While a file is playing, the Play button toggles to a Pause button. Click that button to pause playback, which toggles the button back to Play. Clicking the buttons with double arrows on them advances the playback head at high speed in the direction of the arrows. (Click once to advance at 2x speed; click again to increase the speed.). If the file has audio in it, you hear the playback at high speed, which sounds like an episode of those helium-inhaling Chipmunks. To advance through the file, drag the playback head in either direction. This action is permissible while the file is playing or when it’s stopped. When you drag the playback head, however, you miss out on the high-speed sound and video that you would get if you used the buttons. To adjust the volume of a movie, simply move the volume slider left or right. To mute the volume, click the speaker icon to the left of the volume slider. Sometimes you might want to play a piece of media more than once. In these situations, you need to loop the playback. To force a movie to loop, choose View→Loop or press Command+L. Press Command+L again to turn off looping.